Already read part one? Read part two of the article here. Originally posted in Issue #2 of Connected on September, 7 2014. Thanks to Marco Dini for the Italian translation of the full article. da•ta rash ‘dātə ‘rash, n. an irritating or unsightly eruption of information on the wrist or other site of wearable technology. Every technology has its toxic byproducts and associated maladies. The pollutants of the industrial era cursed us with black lung, lead poisoning, radiation sickness and more. Now the information age threatens to ding us with the damaging, if less deadly, ailments of data pollution. For all the remarkable opportunities that information technology has unlocked, it’s hard to dispute the downside of our diminished ability to focus, to find calm, to connect with the people we care about. As social networks spew a dazzling blizzard of text, images and alerts, we’re buried under the impossibility of consuming those messages as quickly as they are produced. Online, we enjoy the illusion of companionship without the demands or benefits of friendship. Offline, we test our genuine friendships by gazing into glass slabs instead of enjoying one another’s company. And now here come the wearables. I’m a technologist, an enthusiast, an optimist. I’m beside myself about the possibilities of ubiquitous computing. But I’m also concerned that the first generation of wearable gadgets is buffeting the body in unintended ways, like so many other technologies that came before. Will our skin burn with bubbling boils of data? Will our ears buzz with non-stop notifications? Will our eyes flicker with the alerts streaming across the clothing and accessories of others? There are so many opportunities in the fact that we can now wear data. But the risk is that it will wear us. It doesn’t have to be that way, of course. Careful, humane design can give us the benefits of wearing data without allowing information poisoning to seep beyond the screen and into our physical selves. Some suggestions: design for pre-attention; design for fashion; design for identity; design for the individual; and design to amplify our humanity. Designers of smartphone interfaces did their jobs a little too well. They created experiences that are so engaging that they soak up all of our attention. They did it by combining very personal data, social interaction, and a hefty dose of FOMO into a visual interface that requires focus and concentration to make sense of it. Our screens become the foreground to everything else, and in the moments when we allow them to fade to the background, alerts prompt us to pick them up again. This model is not a promising future for wearables. Smart-watch designers, however, seem to be smitten with the idea of strapping a smartphone equivalent on your wrist. These watches strive to replace or supplement smartphones with screens that update you constantly with the latest info. This “convenience” imposes more information onto your body than it can or should bear. As the internet of things turns everything—every object, every place, every person—into a potential interface, those interfaces have to be more discerning. They should demand our attention only at truly demanding moments, not at the receipt of every new email. The real luxury of wearing information is not in exposing ourselves to every passing data point but in filtering that data in ways that alert us gently, even subconsciously, to changes in our environment. Cognitive science has a name for this. Pre-attentive processing is the way our brains gather information from the environment when we don’t even realize it. In the flash of an eye and without even a moment of concentration, we detect changes in temperature, in color, in motion, in facial expression. We process these environmental cues subconsciously, without effort, so they don’t compete with or intrude upon the subject of our conscious focus. Contrast that with the concentration it takes to read even a short text message, an activity that requires you to tune out everything else for a few seconds. Designing for pre-attention makes the information display so subtle that it becomes practically instinctual—a spidey-sense awareness of your personal data. The original wearable technology—the watch—is a model of this kind of ambient, low-impact display. Unlike phones, watches don’t push or interrupt but quietly make their information available whenever you choose to seek it out. That information also happens to be highly glanceable, consistently formatted, and requires virtually zero cognitive overhead. We glance absentmindedly at clocks or watches without losing the attention we’ve invested elsewhere. As an information interface, the watch is neither greedy nor preening. Turning a watch into a smartphone undoes all of that elegance. Ideally, the smart things we wear on our bodies shouldn’t ever buzz, beep, or tantrum. They should quietly respect our attention, standing ready to deliver information with as little distraction as possible. 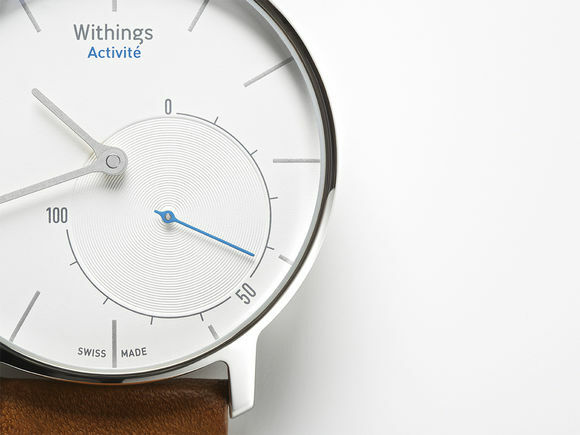 The Withings Activité is one of the few smart watches to embrace the original, inspired interface that served analog watches so well. It’s a pedometer that does the usual fitness-tracker stuff, syncing via bluetooth with your devices to track your steps and sleep patterns. But its display is decidedly low-res; a simple dial shows your progress toward your daily goal, from zero to 100 percent. It’s elegant, nonintrusive, and by the way, the battery lasts a whole year, not just a few hours. All pre-attentive interfaces are similarly simple, though not necessarily so analog. If you must design a watch that alerts you to the state of your inbox, for example, there are better, less intrusive alerts than numbers, beeps, or buzzes. Just ask Bilbo Baggins. In The Hobbit, Bilbo’s sword Sting glows when orcs are nearby, its glow growing stronger as danger increase. Sting is a pre-attentive approach to personal safety. A pre-attentive approach to smart watches could do the same, changing the color or intensity of a glow as messages from certain people start to pile up (family or coworkers in this case, not orcs). This shift in color or intensity is, for all practical purposes, a single-pixel display. It’s a low-resolution signal that cuts out unnecessary detail to give just enough info to make a decision or dedicate attention. When this glow reaches a threshold of importance, you can turn your focus to a different, more attentive display, like your computer or phone. Happily, this glowing “Hobbit effect” could also be beautiful, which you’ll read about next week in part 2 of Josh’s article. In it, he discusses design for fashion, design for identity, design for the individual, and design to amplify our humanity. Published here on October 29, 2014. Smart Watches, Wearables, and That Nasty Data Rash – Part 2 by Josh Clark Josh Clark explains four more techniques for wearable technology.